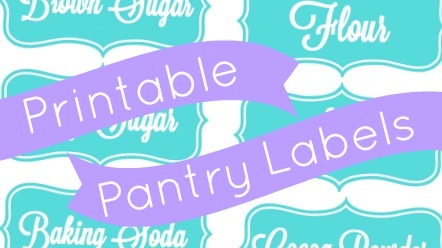 New Wave Domesticity: Baking Cabinet Organization + Kitchen Label Freebies! Baking Cabinet Organization + Kitchen Label Freebies! I have been hard at work getting lots of spring cleaning projects done around the house & my baking cabinet was a big one for me. When we moved into our house, we didn't have a whole lot of counter space or storage, but we did have a nice big kitchen with plenty of open space. In order to take advantage of the space and fix the lack of counter space issue, I found this a roomy old dresser with plenty of storage space at a thrift store a few years ago. I decided that it would be perfect to store all of my mountains of special baking supplies. Of course, extra space for me often means extra messy junk drawers & it was really quite a mess of good intentions gone bad. This week, I tackled it all and I am delighted to have a nice, organized accessible place to inspire baking projects! Armed with some dollar store bins, I organized all the drawers and now all of my decorating tips, extracts, and sprinkles are right where they should be. I used a tall jar (I believe it is intended for spaghetti) to get all of my cupcake wrappers under control...and it just looks pretty darling on the counter! I buy the vast majority of my baking supplies in bulk, so I needed an organization system to get all the bags under control & let me easily know when I needed to add them to the grocery list. I got some cute Ikea jars & now all primary baking pantry items are right at my fingertips! And of course I needed to make them a little extra cute if they were going to be out on display, I designed these adorable labels. And just in case you need some labels to help inspire your cleaning, I'd love to share them with you! Download the printable labels here! These are beautiful. How did you print them? Did you use avery-like labels? A Trip to Vancouver, B.C. Thrift Scores: Pugs, Giraffes, and Pyrex!